Are Activist Investors Helping or Undermining American Companies? 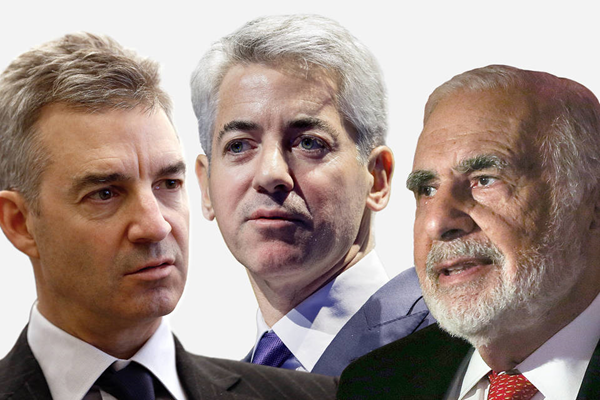 Activist investors, from left to right: Daniel Loeb, William Ackman and Carl Icahn. The rise of activist investing has sparked debate across markets, boardrooms and even during the presidential campaign: Are activist shareholders good or bad for business? The Wall Street Journal examined that question with a comprehensive look at what happens to large U.S. companies after an activist arrives. The conclusion: Activism often improves a company’s operational results—and nearly as often doesn’t. Click to see what happened at large U.S. companies that were targeted by activist investors. 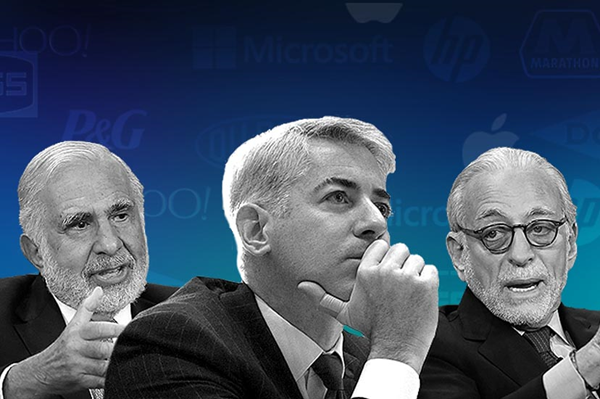 There has been a marked rise of activist investing over the past several years, with hedge-fund figures such as Nelson Peltz, William Ackman and Daniel Loeb buying up stakes in some of the nation’s biggest companies, such as Procter & Gamble Co., Yahoo Inc. and Apple Inc., pushing for changes from buybacks to breakups. In the latest moves, Mr. Peltz’s Trian Fund Management LP on Monday announced one of activism’s biggest investments ever, a $2.5 billion stake in General Electric Co. Also Monday, Ellen Kullman said she is stepping down as chairman and chief executive of DuPont Co., whose shares have struggled since the chemical giant in May blocked Trian’s bid for a board seat. The Journal looked at 71 campaigns against companies with market capitalizations of more than $5 billion over a period dating back to 2009, the start of the surge of agitation. The review studied changes at these companies in earnings, margins, corporate spending, employee efficiency and shareholder return versus peers. The resulting data bolster the increasingly popular conclusion that the best corporate response to activism isn’t for a board or chief executive to reactively shun an activist, or to completely acquiesce to any demands. Instead, companies may be better off analyzing each proposal, and the track record of the activist making it, some advisers say. “The focus is changing to whether the idea is good or bad,” says Avinash Mehrotra, co-head of Goldman Sachs Group Inc.’s activism defense and shareholder advisory group. One key factor in judging an idea’s merits, he said, is the time frame an activist is demanding. The review shows that shares of large companies confronted by activists are more likely to outperform stocks among their industry peers than they are to underperform. But the differential isn’t great. Slightly more than half, or 38, of the situations in the Journal study led to better shareholder returns than industry peers for the period studied after the activist went public. In the end, the median campaign beat peers by just under 5 percentage points. At the same time, companies in the study slightly underperformed industry peers in terms of growth in earnings and slightly beat them on profit margins. As for capital spending as a percent of operating cash flow—seen as a measure of reinvestment—of the 48 companies in the study with good data for that measure, 25 raised spending or left it at the same level, while 23 lowered it. While much has been written about the rise of activism, its long-term effect on companies remains little understood and hotly contested. Some contend activists are a much-needed check on corporate leaders, keeping them accountable for their decisions and spending. Others say that activists scare executives from wise decisions that need time to pay off. Still others say it is case by case, a view the Journal’s data support. Even those on opposing sides of the debate have recently suggested that the truth is somewhere in the middle. Laurence Fink, CEO of money manager BlackRock Inc., has argued the economy is at risk because of the kinds of short-term moves often associated with activists, although he says he doesn’t mean all activism is bad for companies. Presidential candidate Hillary Clinton has pledged tax reforms targeting “hit-and-run” activists, though she also says some activists help hold managers accountable. Activists themselves increasingly say not all campaigns benefit companies. In aggregate, the Journal data show, the best chance an activist has at driving outperformance at big companies is by getting a board seat, either for their own employees or a nominee they trust. Of the 38 situations in which activist-dogged companies outperformed industry peers, activists got a say on the board in 24. The outcome suggests that moving the needle at a big company—where leadership is already likely fielding advice from a host of bankers, lawyers and analysts—involves getting a voice in the boardroom. Some activists regularly seek board representation, like Mr. Icahn, ValueAct Capital Management LP, Trian Fund Management LP and Relational Investors LLC. Their successes include Adobe Systems Inc. and Forest Laboratories Inc.
ValueAct used the board representation it had in all seven of its investments to outpace its rivals in the study. The San Francisco-based firm, whose founder and chief executive Jeff Ubben has been outspoken about his industry needing to avoid short-term profits at the risk of tarnishing themselves, had all seven of its investments in the survey beat peers, with a median 16.5 percentage points above peers. Mr. Ubben was recently nominated to the board of 21st Century Fox, which until mid-2013 was part of the same company as Wall Street Journal publisher News Corp.
Others clearly see the value of board intervention in big companies as well. In the 71 campaigns the Journal reviewed, 46 sought board representation and 40 got it. Still, board influence doesn’t ensure shares will rise: Sixteen companies that saw activists get on the board underperformed their peers. That included J.C. Penney Co., where Mr. Ackman’s intervention contributed to an attempt to change corporate strategy that fell flat. J.C. Penney was the worst performer in the study compared with peers, and had the second-worst total-shareholder return. Only bankrupt energy company Walter Energy Inc. came in worse. Far fewer activists working at the large-company level seem to bother with one of the most common requests for activists—stock buybacks, a generally shareholder friendly way to spend corporate cash. In the sample, activists sought buybacks in 25 of 71 situations. The message: If you’re going to target a big company, you’ve got to get more creative than just asking for a cash payout. Copyright ©2015 Dow Jones & Company, Inc. All Rights Reserved.